Alright - I know, it's been a while since I've actually posted multiple times in one day... but I wanted to give everyone as much time as possible to decide on the second item before the official kick off! For those of you that don't know, I used to do this as a side business with a website that I managed back in 2005-2006. The sales couldn't meet the demand/cost of keeping the site active and the merchant licenses active... so we had to close it. Honestly, making it a business took some of the creativity and fun out of it as well. That's where Etsy comes in - because my plan here is to not manufacture items, but create one of a kind pieces that can be a beautiful addition to your wardrobe. So, a few things that are classics might get repeated as they sell - but most things will be kept at one of a kind creation status. Unless you specifically talk to me about the availability of making multiples... I've created pieces for entire wedding parties as well as recreated some things from magazines - so the sky is the limit! I'd love you know what you guys think of the items as they are listed. 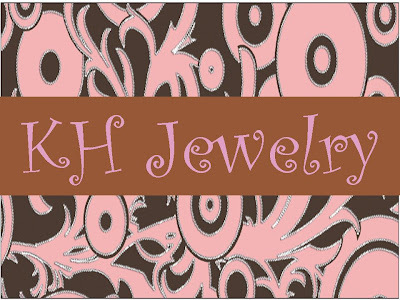 I will put a permanent box on the blog so that you can click over at any time... and as new items are created - I'll probably blog about them, and remind you that you can go over to the store and see them. I tend to get excited when I get crafty and want to show everyone what I'd done. Starting on Monday (for the month of June) - I'd like to invite you all to join me in a 30 day workout challenge. I will personally be doing the 30 Day Challenge on the EA Sports Active game, BUT I don't want that to limit anyone. 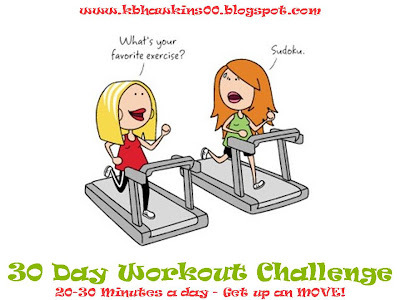 Another friend mentioned doing the 30 Day Shred... so the idea here is that we get up and move for 20 to 30 minutes a day, EVERY day for 30 days. You can do whatever activity suits you best... walk, run, jog, treadmill, swim... videos, video games, or just the open road... I'd love to share in this journey with as many of you as possible... so please let me know if you plan on joining us. It's not like I'm going to whip you if you can't get through it... just commit and see where that leads. Even if you stumble for a day - don't worry about it - just pick back up and keep going. What I would like to do though is set up an email group so that I can check in with everyone every day or two and see how it's going. So drop me a comment here and tell me that you'd like to join, and make sure that I have your email address. I can't wait to see what happens over the next 30 days! Sign me up for the challenge!! It might just be what I need to get myself motivated these days! My active sports just came today in the mail! Can't wait to give it a shot! Ps this is Katie, but I can't get my google log in to work, so here I am as anonymous! Does running after 2 toddlers count, lol I can't wait to go look around your etsy store. It looks like the link to your Etsy store isn't working. Might want to check that out...as for the 30 day commitment, I dunno. Now that T will have the vehicle in the evenings, I won't be able to get to the gym and I'm pretty much limited for activities where I live. you already know i am in. also, i am so glad all is up and running at etsy. i will check it out very soon! Yeah for your Etsy store! I know everyone will love it! I need to hit the gym sooo bad...even a 5% loss in weight increases your chances of pregnancy greatly...so I need to hit the gym again and this is good motivation....we need to keep each other motivated! I am and so is my friend and my sister (I think). I will check with them! I am also joining WW tomorrow. Big day for me. I'm in, although the type of exercise may not be consistant. With us going out of town, some of it may just be loading/unloading the car (weight lifting). Duh! I meant to also comment on your etsy store. Congratulations on your store opening. You have some beautiful pieces!